Establish a "Routine for Reading" and you will be amazed at the amount books you will read with your children. Our family has a "Routine for Reading". Each night we read three books before bedtime. My two children and I each choose a book to have read aloud. The books come from the bag of books we have selected from our local library. Many of the books, but not all, are chosen to celebrate the birthdays of children's book authors. 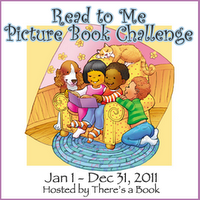 Our family has been taking part in the Read-To-Me Picture Book Challenge hosted by There's a Book (an awesome blog!). This challenge is designed for families that love picture books. The deadline to join is November 20, 2011, but why wait until then because there are going to be prizes to win each month. To sign up for the contest click here and make sure you read all the details! I am so excited for this challenge because I have always wanted to keep track of the books we read! I have been amazed at the number of books that we have read but only reading 3 books each night. But, it does make sense; 3 books x 365 days = 1,095 books each year! Wow - it almost sounds crazy that over 1,000 books could be read by spending only 30 minutes each night! Here is my challenge statement: I will be "reading with my children" at the "Harvesting" (200 picture books) challenge level. I am going to keep a running tally of the books we have read. No duplicates will be included in the count, but will be mentioned.